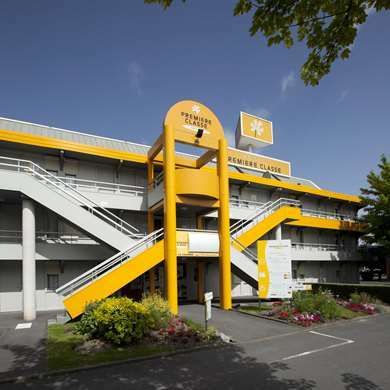 Our 3-star Hotel Kyriad Besançon – Palente is ideally located near Besançon. 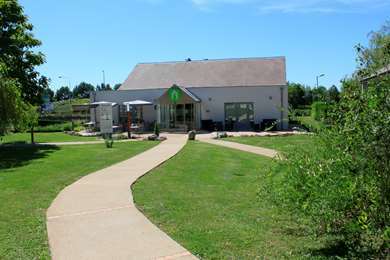 Our hotel is very easy to access from highway A36 (exit 4.1 Palente) and from the Besançon-Viotte SNCF train station, located just under 2 miles away. Reception is open from 7:00 am to 10:30 pm weekdays, and 8:00 am to 9:00 pm on week-end. You can dine at the hotel from Monday to Friday noon. Ideal for a family vacation, week-end get away or business trip to Besançon, our hotel ensures all the comfort and quiet you need for your stay. Our 45 renovated rooms are available for reservation, and we also have a free private parking lot. Come discover Besançon, a UNESCO World Heritage city, that is watched over by its majestic citadel and ramparts built by Vauban and that offer superb views overlooking the city and surrounding areas. Please note our air conditioning system is currently out of order. Our hotel offers 45 renovated rooms with options including one double bed, two single beds and family rooms. The hotel has an elevator serving all floors. The rooms come with all the amenities including a private bathroom with shower and hair dryer, a 26 in. TV with a selection of satellite channels, desk with phone where you can do your work and a courtesy tray. You also have free Wi-Fi access throughout the hotel. 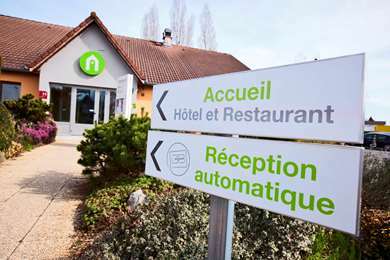 Our modern hotel has two rooms that are specially adapted to the new standards for people with reduced mobility. Every morning, from 7:00 am, Hotel Kyriad Besançon – Palente offers an all-you-can-eat breakfast buffet, with a wide and varied selection. Take the time to start your day off right. Excellent service and very friendly staff. Good food and the breakfest much better than expected. Room ok, but the bed was way to hard and the Airconditioning was not working very well and needed service. _Very_ quiet on our January saturday night stay - at one point I thought we were the only guests! Our room was at the back, so no noise. Room itself was okay, although the furniture is a bit '90s-ish. Shower room was adequate, but there was no mount for the shower head so had to hold it. Reception staff disappeared for early evening and didn't re-appear until breakfast (which we skipped as 8am is too late for people travelling). Lift wasn't working and the notice saying it was broken had obviously been there some time. Coming there at 15 o'clock, the reception is closed, no staff in sight, we tried to call them, to only getting through automatic message box. Luckily we meet another tourist group who were having meal outside of the hotel, so they helped us to open the entry door with their access code and told us to get our own room key. We entered the reception hall for our keys, we found no key but only our names on an allocated guests on the desk, then suddenly the alarm triggered. We didn't know what to do but somehow feel relieved hoping somebody from the staff will show up now we succeeded in making noises. 5 minutes, nobody shows up. The other group of tourist suggested us to check our allocated rooms to see if the keys are there. The alarm stopped, but still, nobody shows up, few minutes later, there are voices coming from the intercom next to the reception door. It was the security service asking for the password for the alarm incident. I answered them we are guests at this hotel and the staff can't be found hence I don't know the password and I can't even contact the staff. The security replied "ok". The alarm triggered again for another 30s then turned off. We went up to our allocated room (according to the list we found) finding that our keys are attached to the key lock. We got a double bed, white bed sheet, correctly arranged, but... a big BUT, they are honest enough to not hiding the big hole in the sheet on my bed... honesty sure is a good virtue of theirs. The toilet stands correct with towel, soap, 1 tiny bottle of shampoo, and less than a quarter of the toilet paper scroll, and sure, I should have asked staff for more... oh wait, what staff again? This Kyriad is located on the outskirt of Besançon. You can easily catch a bus or the new tramway. Rooms are clean, coffe and tea are waiting for you, and you can order food. However I recommend to book at the back of the hotel if you're sensitive to traffic noise. A convenient and friendly place to stay.